In the heart of the hustle and bustle in Morningside, lies The Enchanted Day Spa. An old charm structure overflowing with tranquility and peace. A perfectly comforting ambience set for the epitomy of relaxation. Let Igesh and her team of helping hands release all your stress and tension or spoil yourself with one of their pamper treatments. Come one, come all .... we accommodate couples, groups,mendhi parties, bridal showers and can work-out a package that suits your requirements and budget. With treatments so reasonably priced we can definiately afford to spoil ourselves like I do, be it with A Mantra Facial, Foot or hand treatment, or an additive massage. 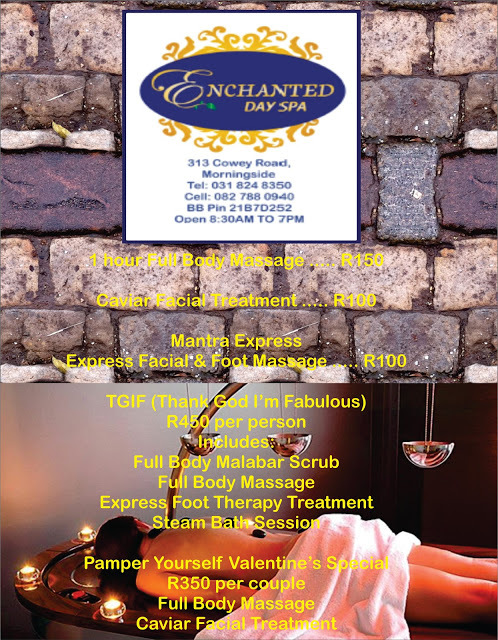 The also offer Waxing, Threading, Laser Treatments, Bridal packages - hair, make-up and mendhi. The Spa stocks the Mantra Range of Ayurvedic Spa Products and other Body treatment products. The friendly and peaceful atmosphere and the awsome service all patrons receive at this stunning spa, I cant resist being there every week! Here are the current specials at the spa. Although very accommodating, booking is essential!